Delaware City Hall is located at 1 South Sandusky Street, Delaware OH 43105; phone: 740-203-1000. Photo: Elliott Hall, Campus of Ohio Wesleyan University, Delaware, OH. Listed on the National Register of Historic Places in 1973. Photographed by User:Wikipicsowu (own work), 2006, via Wikimedia Commons, accessed August, 2013. Ohio Magazine's 2008 list of five "Best Hometowns" includes Delaware among the designees. The City, spread over 18 square miles, is approximately 27 miles north of Columbus. Prior to 1800 the area was variously settled by native tribes including Delaware (Lenni Lenape), Wyandot, Mingo, and Seneca Indians. Delaware County was created from Franklin in 1802. In 1807 John Beard built what is believe to be the first residence by a white settler; the same year, Joseph Barber built a tavern and a court was established and held on the premises. The following year, 1808 the City was platted and designated as the county seat. In 1809 a tannery was built and a post office was established in 1911. During the war of 1812, General William Henry Harrison made his headquarters in Delaware. In 1816 the settlement was incorporated as a village. The first newspaper (The Delaware Gazette) was established in 1818 and by 1820 the village had a permanent population of 250 citizens, doubling to more than 500 by 1830. Delaware is the birthplace of Rutherford B. Hayes (1822, 19th U.S. President). 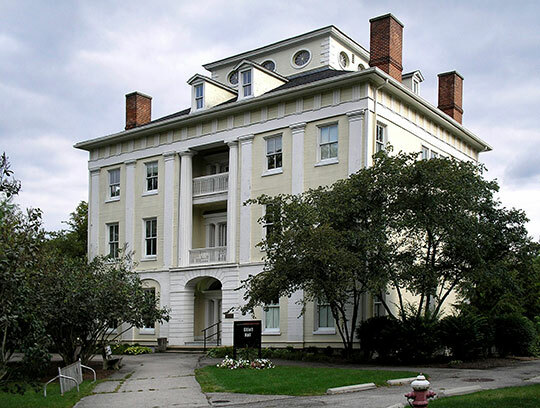 Ohio Wesleyan University was founded in 1842. The two decades, 1830-1850 saw population quadruple to more than 2,000. In 1862 Camp Delaware was established as a Union Army training facility. The 19th century saw business boom, railways built, and population topping 8,000. During the last half of the 20th century, spurred by good access and proximity to the capitol, Columbus, Delaware City's population grew from 10,000 to more than 25,000. As of 2007 population exceeds 30,000 and projects indicate continued growth.